Brighten up the atmosphere of your event or display with our hanging Hot Air Balloon Paper Decoration! 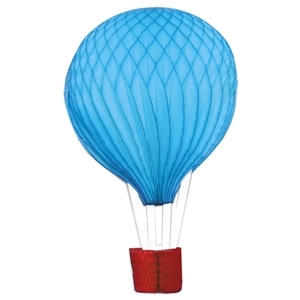 This hanging paper honeycomb hot air balloon is perfect for all events from parties to fundraisers to window displays. Mix and match our wide variety of hanging paper decorations to perfectly suit your event. These paper decorations arrive flat and are easy to unfold and display. They are then easy to collapse and put away for next display, event, party, or celebration.